An artist’s impression of the new-look Michael Moore Car Sales after the extensive business re-development programme is undertaken. 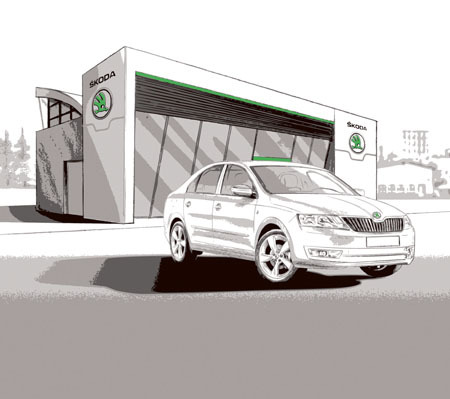 Michael Moore Car Sales has been appointed sales and aftersales dealer for Skoda. An extensive business re-development programme will take place over the coming months which will result in a complete upgrade to the Athlone dealership and an extension of its showroom and facilities resulting in over 20 jobs. Operating in Athlone since 1981, Michael Moore Car Sales is renowned for its long-standing expertise and top class customer service. Synonymous with the motor industry in the Midlands, Moores opened its doors under the stewardship of Michael Moore Senior back in 1972 as Michael Moore Car Sales in Portarlington. Since then it has grown to be one of the market leaders in the midlands area. Westmeath motorists can now test drive the latest Skoda models including the new Superb which will be on show at Michael Moore Car Sales. This year sees Skoda undertake its biggest model launch in the company’s 117-year history and will continue with the Rapid Spaceback expected in the dealership in autumn this year. When is a pest not a pest? Spanish Roads don’t melt in the sunshine so why do ours?